Hello everyone, the Spring 2019 semester is in full swing! We hope that your semester is off to a great start, and have been able to adjust to all of your classes. Our first newsletter of the semester is filled with wonderful resources, opportunities, and events that you might be interested in. Now that you’re all settled into your classes would be a great time to check out what’s happening around campus. Come celebrate! 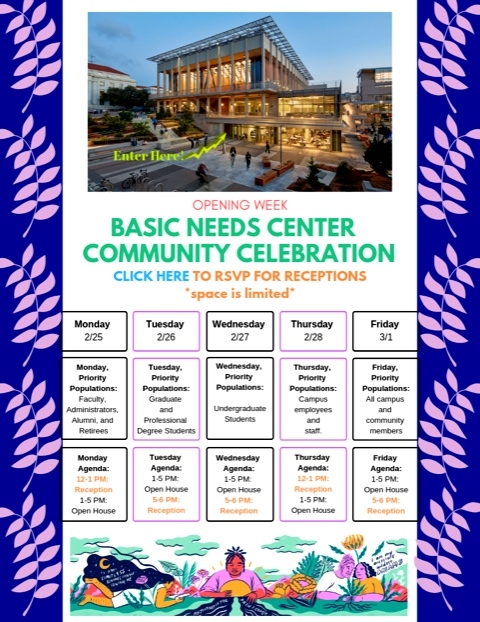 After six years of community efforts UC Berkeley is launching the first-ever Basic Needs Center on campus. Receptions will be taking place form 2/25-3/1. To RSVP for the receptions click here. CS 61b: sing up here. CS 61c: sign up here. CS 88: sign up here. EE 16a: sign up here. UC Berkeley’s Travel department is hosting interviews on campus for the TSA PreCheck service. Interviews to complete the TSA enrollment process will be held at Warren Hall from March 11th until the 15th. Frequent flyers, this one is for you. Click on the button to find out more.